Camp Loll had another outstanding camping season. It is not uncommon for me to receive letters recognizing this wonderful camp and the difference they are making in the lives of Scout and Scouters in our council. This one is a great example and I thought I would share it. 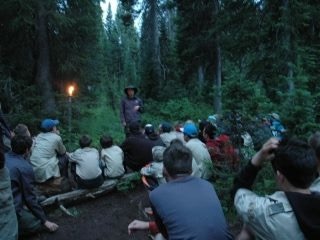 I recently returned from Camp Loll just outside Yellowstone and Teton National Parks and want to express my gratitude and explain what a positive impact it had on me and my scouts. I am the Scout Master for Troop 743 in Fruit Heights, Utah and took the boys this year and last year to Camp Loll. We experienced natural beauty and camped in an environment that has changed us all forever. From swimming and kayaking in the Lake of the Woods to camping in the dense pine trees to seeing the bluest sky we have ever seen, the experience was outstanding. My boys learned the value of living in bear country for a week and packing our smellable items into the bear boxes. They learned the importance of not littering and picking up trash and wrappers even when it wasn’t their doing. They learned the value of not cutting down or carving in trees and respecting the wildlife. In fact we had a deer that grazed in the edges of our campsite the entire week and each time we watched the deer it was like we hadn’t seen it before. We all were mezmorized. We hiked to Union Falls and it was breathtaking. Having lunch at the falls was the high light of our week. The boys learned that staying on the trail is important and respecting other hikers and horseback riders in imperative. They are still talking about the hike and the absolute magnificent experience they had. 30 years ago I too was a young scout at Camp Loll and still remember the Lake of the Woods and Union Falls. Those 2 years of attending Camp Loll as a youth gave me a deep appreciation for the wilderness and the importance of the duty I have to keep it clean and as natural as possible. Those 2 years as a youth is the reason I have returned as a leader so that my young scouts can see and experience the wild forest and learn their duty to keeping it clean and usable for years to come. Those 2 years were some of the fondest memories I have as a youth. Thank you for allowing the Boy Scouts of America to have such a unique and top quality camp in that beautiful forest. ← LDS Stake YW Join The 50 Miler Club!